Aprilia’s Shiver naked sport bike is now a 900, up from the previous 750. Its maximum horsepower from the 90-degree twin is now claimed at 95 hp, but that’s a bit strange because the 750 also claimed 95 hp. Torque is up though, to 66.3 lbs.-ft. from 59.6. Apparently, it’s significantly increased at medium rpms. The bike looks different, with new fuel tank covers, side panels, tail fairing and front mudguard, and it has a super-duper instrument cluster in a 4.3″ screen, the same that’s found on the RSV4. It also has an advanced traction control for taking care of business while you’re busy peering into the super-duper instrument cluster. The full press release is below the photos. 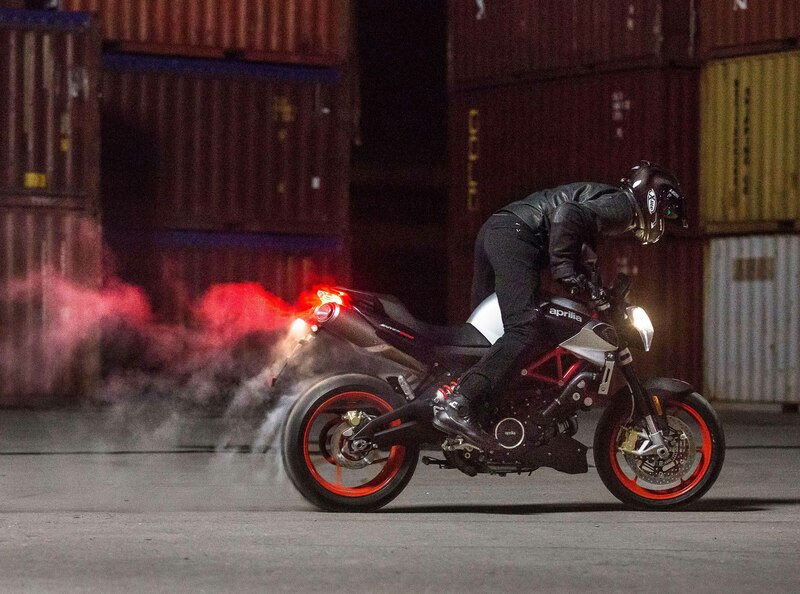 And that rider doing a burnout on the new Shiver? We don’t condone that at all. Not at all. It’s very irresponsible – very irresponsible indeed. Integrated engine management system with Ride-by-Wire. Digital electronic, integrated with the injection. Modular tubular steel frame fastened to aluminum side plates by high strength bolts. Dismountable rear frame. Upside-down fork, stanchions  41, with adjustable hydraulic rebound damping and spring preload. Wheel travel 120 mm. Aluminum alloy swingarm with stiffening truss. Front: Dual 320 mm stainless steel floating discs. Radial, four-piston callipers. Rear: 240 mm stainless steel disc. Single piston calliper. Metal braided line. At last a real motorcycle is revealed, lets hope there will be more!